Note: The online social activism sector is growing all the time, and sharing information and ideas is crucial to continuing that growth – and the very impact on society. We’re happy to carry the excellent Social Actions Round-up of links and resources here at CauseWired, created by the prolific and plugged-in Joe Solomon. Enjoy it – and pass it along! This week came the much anticipated re-launch of Change.org! 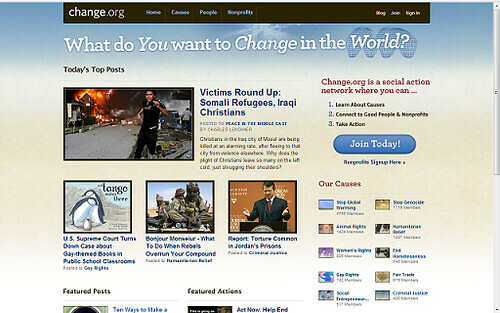 The new Change.org combines online news channels (blogs) that focus on specific issues (i.e. – climate change) with relevant ways to get involved and take action. With a rock-star team of bloggers, and a super tight UI, the new Change.org is definitely worth checking out. You can also check out the posts that covered the re-launch here (including Newsweek, Mashable, and CauseWired) and follow Change.org on Twitter here. This week was also Online Giving Marketplaces – a conference that brought together “online giving marketplaces with philanthropy experts, so as to tap the pulse of what’s really happening on the frontier of philanthropy.” From the buzz I picked up from Twitter (Thanks @TomWilliams and @PeterDeitz), there was much discussions and excitement about collaborating on a philanthropy micro-format, which would unlock platforms’ giving opportunities – enabling 3rd party applications to offer them across the web. Check out Tom Williams’ awesome post for more info. You can also check out VentureBeat’s overview plus Lucy Bernholz’s post for excellent notes. You can also see a slideshow of Kiva’s presentation here. Amazee shared a Drupal Case Study on their re-design here. Reminder from Beth Kanter’s Blog: Blog Action Day is Oct. 15th (next Wednesday). You can sign up here and grab a “Take Action on Poverty” widget for your blog here. Lend4Health won the first sprint on IdeaBlob! Now Tori Tuncan created a campaign on ThePoint to encourage people to vote in the next and final round! Alex Steed got a matching $5,000 grant from the Case Foundation! In order to get the money, however, he needs your help to raise $5,000 (he’s over halfway there!) – You can chip in here. Britt Bravo asks “Have You Used Social Actions’ Search, WordPress Plug-ins, Widgets, or TwitterFeed Mashup? We Wanna Make You a Star!” – Got a story? Share it here. Christine Egger introduces The Small Change Fund, a new organization providing small grants to local, grassroots groups across Canada. They recently approached the Social Actions team for strategic advice on how to include individual Canadians in their grantmaking process. With their permission, we’ve brought the conversation into a forum to encourage as broad a range of insights as possible – Join the conversation! Peter Deitz shares his vision for micro-philanthropy at Online Social Marketplaces 2008, a closed event organized by and for grantees of The Omidyar Network. Each week, Social Actions community members post links and news about online social activism – This round-up is a summary of the links that surfaced in the last 7 days. New: As a bit of an experiment, you can now share links and news for future Social Actions rounds ups in the Peer-to-Peer Social Change FriendFeed Room.